Check weighers are widely used in production environments for checking manufactured components / products to make sure they are within specification. 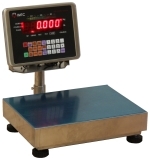 The basic Check weighers provide a weight indication the more advance Check weighers providing full printout documentation with T1 and T2 standards recorded. Most Check weighers have a traffic light display to show under correct and overweight readings, more advance units would have a traffic light display column either built into the display or a remote option is available. Trade and non-trade Check weighers range have finishes from polypropylene to stainless steel from IP55 to IP67 standards. A range of printers can be retrofitted to most Check weighers with the facility of a computer linkup via Ethernet, data card or USB connection.